Banking on our enriched industry experience, we are able to offer a wide gamut of Digital Storage Oscilloscope. Our product range also comprises of DC Electronics Systems, AC Electronics and Semi-Conductor Devices. 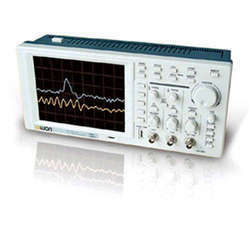 Our company is engaged in offering a comprehensive range of Digital Storage Oscilloscope. This high performing Digital Storage Oscilloscope is available in the market under thebrand name 'Owon'. The general application of these instruments include Design and debug in electron circuitry, Industry controlling and power measure, View moment signal, Test in the manufacture, Education and training and Serving and maintaining.